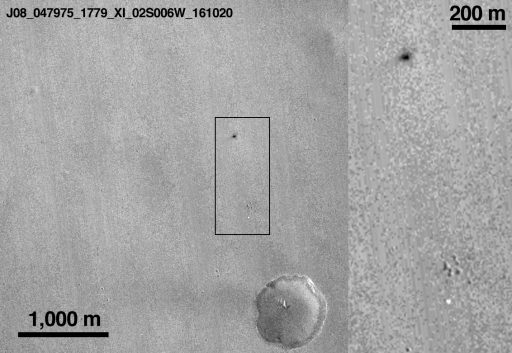 ESA had been reluctant to confirm the 577-Kilogram Schiaparelli had crashed due to a lack of definitive data available in the immediate aftermath of the landing attempt, but new images from NASA’s Mars Reconnaissance Orbiter leave no doubt that Schiaparelli made a shattering impact in the Martian Landscape. Schiaparelli was sent on its way to Mars on Sunday when separating from the Trace Gas Orbiter that shepherded the lander to Mars and is responsible for delivering the vast majority of the science expected from the ExoMars 2016 mission, studying the Martian Atmosphere for a mission of at least five years and making unprecedented measurements of trace gases relevant for astrobiological assessments. 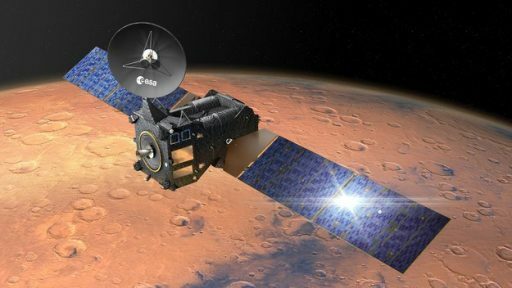 The Trace Gas Orbiter successfully placed itself into orbit around Mars on Wednesday, firing its main engine for over two hours to slow down and be captured in an elongated orbit around the planet. 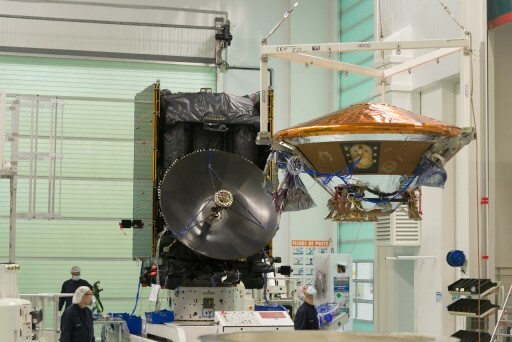 Schiaparelli arrived on the outer edge of the Martian atmosphere at 14:42 UTC on Wednesday and was set for a fast-paced descent that was envisioned to take six minutes to bring the lander to a soft touchdown in a flat area at Meridiani Planum. Schiaparelli, formally known as Entry, Descent & Landing (EDL) Demonstration Module or EDM, set out to validate the technology needed to master a successful landing on the Martian surface to pave the way for the ExoMars 2020 mission that aims to soft-land a European Rover and Russian-built Surface Platform. As an engineering test with science measurements only considered a bonus, Schiaparelli’s designers accounted for the possibility of failure and made sure the lander would send its most critical flight parameters in real time so that a complete reconstruction of the landing sequence could be made in case of a hard landing. This data, recorded by the Trace Gas Orbiter and played back in the overnight hours to Thursday, initially raised more questions than it answered as the first analysis revealed contradictory information. According to a preliminary reconstruction of data, Schiaparelli had a smooth re-entry – hitting the atmosphere at a speed of 5.83 Kilometers per second, protected by its forward heat shield. Parachute deployment was confirmed in real time through Doppler Measurements received on Earth and the data playback confirmed that the chute opened and Schiaparelli dropped the forward heat shield to expose its Radar Doppler Altimeter to begin taking altitude and speed readings for the coordination of final descent events. In statements made on Thursday, ESA officials said that the release of the Surface Platform occurred earlier than planned in the landing timeline. Next, the landing engines ignited but only fired for three seconds before switching over to ‘landing mode,’ shutting down for reasons that will be scrutinized over the coming days and weeks. In comments made on Friday, ESA’s Paolo Ferri said the radar altimeter was working properly, ruling out a false sensor input confusing the lander into thinking it had already reached two-meter altitude where the engines were expected to be cut. Another 19 seconds of data are available after the premature engine shutdown until the signal from Schiaparelli was lost – most likely at the point of its hard impact. 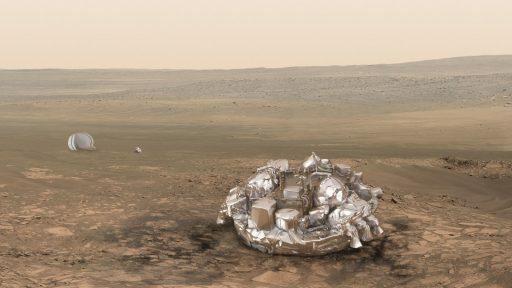 The Trace Gas Orbiter recorded around 600 Megabytes of data during Schiaparelli’s ill-fated landing attempt and ESA engineers are confident that – given enough time – a comprehensive reconstruction of the EDL sequence can be extracted to reveal exactly what happened to the lander. 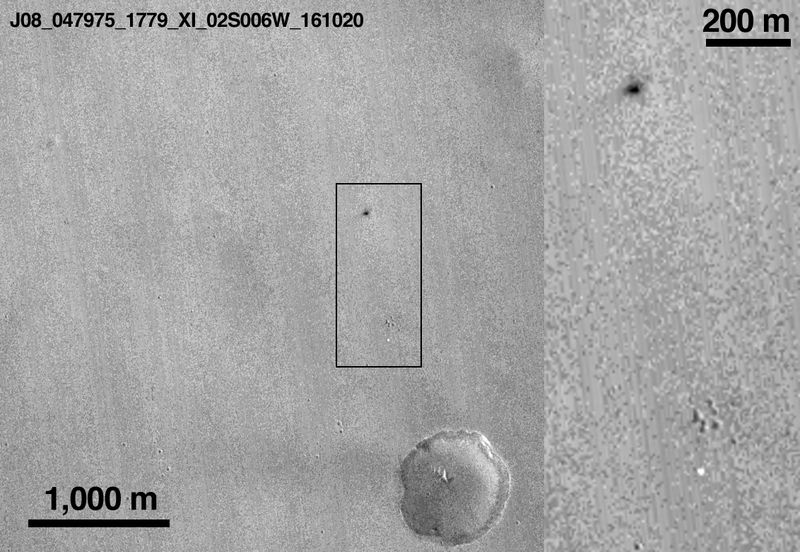 On Thursday, while teams at the European Space Operations Center had just started pouring over the data to understand what happened to the small lander, NASA’s Mars Reconnaissance Orbiter passed over the expected landing site in Meridiani Planum and collected black-and-white images with its Context Camera (CTX). 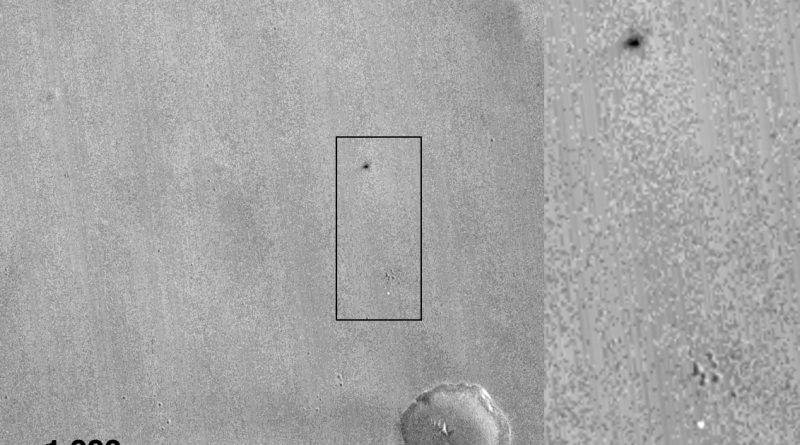 The images released on Friday have a resolution of six meters and clearly show the site of Schiaparelli’s impact and the location of its 12-meter parachute. The dark patch in the image – corresponding to Schiaparelli’s final resting place – is about 15 by 40 meters in size. The size of the surface scar created by the lander arises from the surface material disturbed at impact and a possible explosion of the lander when its propellant tanks ruptured – likely still containing ~90% of their original load of Hydrazine propellant due to the shortened burn time. The Mars Reconnaissance Orbiter will collecting high-resolution color imagery of the landing site next week with the High Resolution Imaging Science Experiment, capable of collecting photos at a 0.3-meter ground resolution. The parachute is located around 900 meters from Schiaparelli’s impact site that is located only 5.4 Kilometers from the bulls-eye landing target – confirming that the re-entry trajectory was as expected. 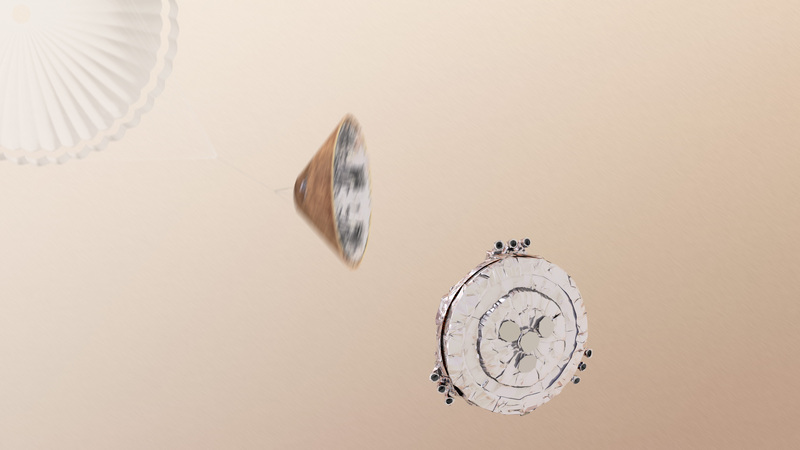 Because the mission used a ballistic entry, the landing ellipse was 100 by 15 Kilometers in size accounting for uncertainties in the lander’s trajectory as well as unpredictable variations in the Martian atmosphere. 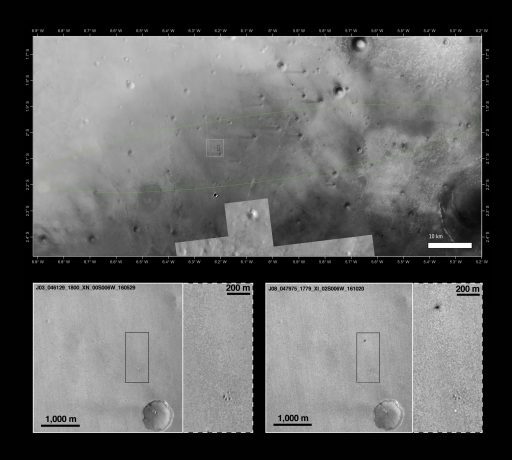 Estimates based on the scene observed in the images and initial analysis of data conclude Schiaparelli dropped from an altitude between 2 and 4 Kilometers and impacted at a speed greater than 300 Kilometers per hour. Per the nominal landing sequence, Schiaparelli was to cut itself loose from the parachute only 1.2 Kilometers in altitude and the above statement indicates separation took place much earlier than planned. ESA expects it will take two to three weeks to piece together the reconstruction of Schiaparelli’s landing attempt and reveal what caused the lander to cut off its engines prematurely and plummet to the Martian surface. Classed as an experimental test lander, Schiaparelli fulfilled a large part of its function by sending back data that will allow a complete engineering assessment of its landing maneuver and the response of its subsystems, pointing to possible design deficiencies and thus increasing the likelihood of success for subsequent missions. However, calling the Schiaparelli landing experiment anything but a partial failure is a stretch. 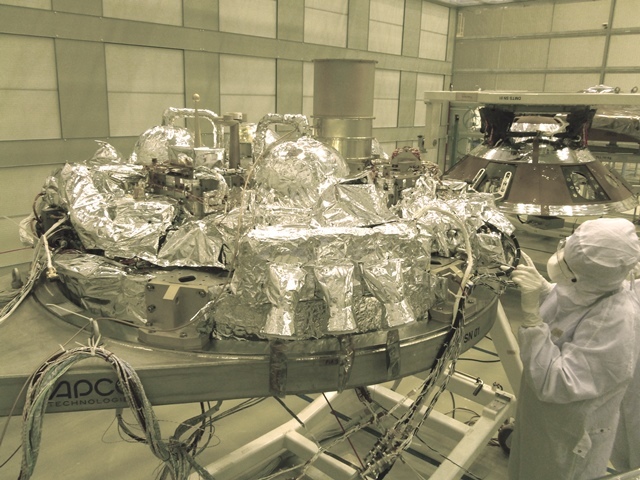 In a Blog Entry, ESA Director General Jan Woerner, places an 80% success rate on the lander’s mission taking the volume of downlinked data as a basis. While it is true that extremely valuable data was returned, EDM still failed to accomplish a major part of the EDL demonstration – the L for actually Landing. Also lost as a result are 15 images presumably taken by the Descent Camera while descending under the chute as well as the prospects of collecting several days of valuable atmospheric data including the first-ever measurement of the electric field on the surface of Mars. 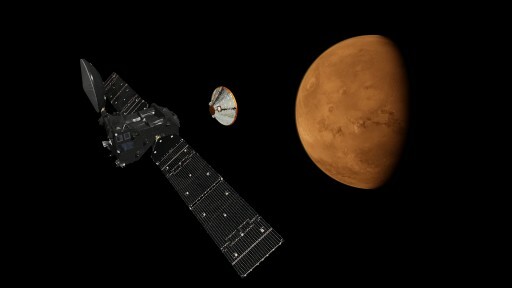 Nevertheless, the failed landing of Schiaparelli should not overshadow the successful orbital insertion of the Trace Gas Orbiter that is now set for a multi-year mission studying Mars and providing an orbital communications terminal for the rovers currently active on the surface of Mars and those that will arrive in the coming years – NASA’s 2020 Rover and the ExoMars 2020 rover & platform.